Network Inventory Advisor is an agent-free solution for network inventory with flexible interactive HTML reports. It helps you inventory software and hardware, compile general network summaries for detailed analysis, go back into history for comparison with a snapshots feature, and more. Network Inventory Advisor inventories networks of any size tracking location and types of all the devices you administer without the need to install additional software on remote assets. 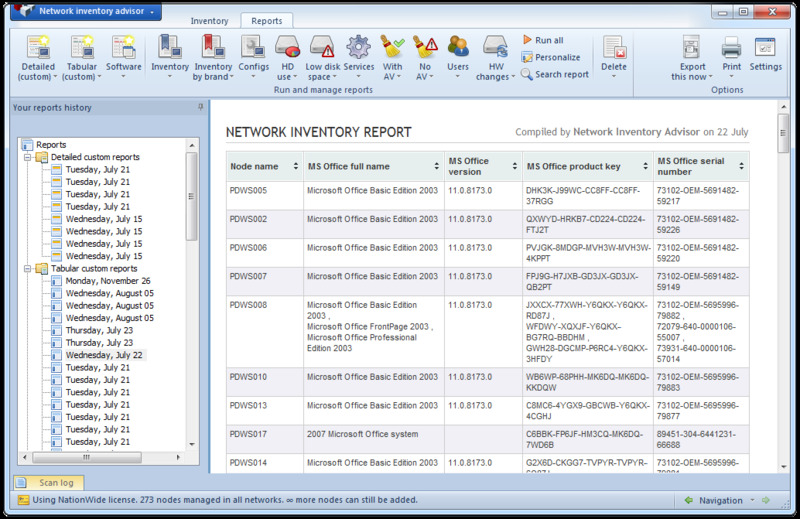 Network Inventory Advisor fully supports remote inventory of Windows 9x, NT, XP, 2003, Vista and 2008. WindowsNetworking.com members get a 25% discount when using the coupon code 'WN-COUPON'. 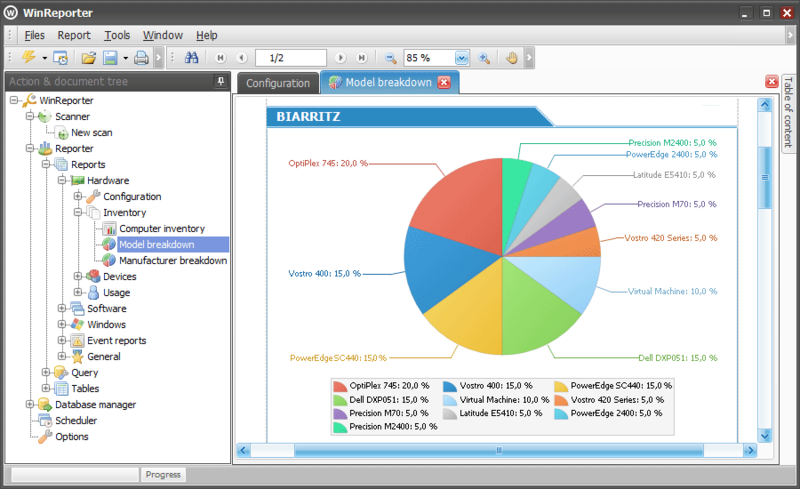 Introducing Total Network Inventory 2, PC audit and software inventory solution. Network scanning: Windows, Mac OS X and Linux-based computers can be scanned without preinstalled agents. Scan single nodes, network address ranges or Active Directory structure. Inventory: several dozen kilobytes of data for each computer are available in the centralized storage of TNI 2. Total Network Inventory 2 will present your network in all its beauty! 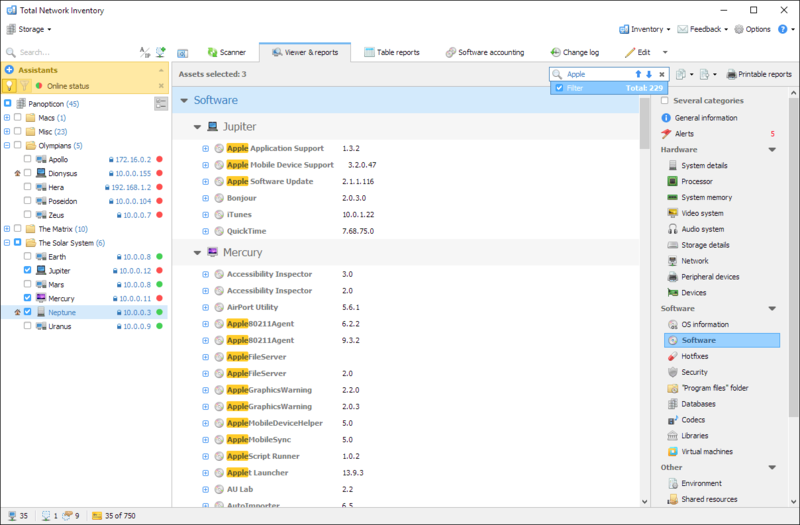 Reports: create flexible reports on different data categories. Build table reports with hundreds of fields. Software accounting: the list of software found in the network is at your service. With just a few clicks you will see the number of software copies and the list of computers it is installed on. Leveraging a unique multi-level discovery technique, LANsurveyor automatically discovers your LAN or WAN and produces comprehensive, easy-to-view network diagrams that integrate OSI Layer 2 and Layer 3 topology data (including switch-to-switch, switch-to-node, and switch-to-router port connections). With two mouse clicks, this data can be exported into Microsoft Office Visio and easily shared with your colleagues. Additionally, LANSurveyor will automatically track and account for changes to the network in real time with a unique continuous scan feature that can immediately detect new devices on the network and dynamically update the network map. Network Asset Tracker Pro is a comprehensive network inventory solution that enables you to scan all the nodes of your network with just one click. Get complete information about operating system, service packs, hotfixes, hardware, software and running processes on remote PCs. Powerful reporting module helps you save a lot of time for preparing asset reports. You can get information from remote PC through WMI (agentless method) or, if you have any problems with WMI, you can use "NAT Pro - Agent" installed on remote PC (agent-based method). Network Asset Tracker Pro automatically detects if "NAT Pro - Agent" is installed on remote computer. Manage and collect all hardware and software information from all windows computers in your network. Calculate license costs, create alert reports, maintain allowed software, get active directory information all without installing an agent on your computers. All administrators in your company can browse the computer details, can run custom actions and can view reports in the intuitive web interface. If standard reports are not enough for you, why not build your own based on custom files and registry keys that you can scan. Download completely free network inventory software for IT pros in small to medium businesses. *This is NOT a free trial, "freemium", or stripped down verision. * Spiceworks provides access to the entire software suite whether you're a one-person operation or you manage 1,000 network devices. And it's free forever - including live support and all product upgrades! In addition to a state-of-the-art network monitoring and management solution, Spiceworks software also offers free access to: a full-featured help desk, troubleshooting tools, asset management software, power management tools, and an online community of IT pros like you to answer questions, share tips, and solve IT problems. Download today - and share with your peers! Network Inventory Monitor allows you to create a network inventory. This program gives you the possibility to get information about operating systems, service packs, hotfixes, hardware, installed software and running processes on remote PCs. You can get screen shots from a remote computer and send messages to a remote PC. Also you can create reports about hardware, installed software, and running processes on computers in your local network. Supports Microsoft Windows 98, Me, NT, 2000, XP, 2003. Alloy Discovery is a network inventory solution for network administrators and IT service providers, advancing the Alloy Network Inventory product line with next generation technology. Targeted for small and medium business environments, it offers a compelling menu of features and usability, delivering information in a matter of minutes from the moment you install it. Alloy Discovery enables you to: Remotely audit Windows, Linux, and Mac OS computers on the internal network; Schedule automated audit of networked Windows, Linux or Mac OS computers; Identify networked devices (printers, scanners, network routers, hubs, switches, etc) and capture SNMP data; Manually audit standalone computers using a flash drive; Track the hardware and software information in your organization; Analyze the hardware and software inventory data with filtering, grouping and sorting techniques; Plan hardware upgrades with a list of installed device drivers, PCI slots, hard drives, and memory modules; Identify potential security violations with a complete inventory of startup entries, shared folders, and mapped drives; Pinpoint software issues using consolidated event logs; Perform various network management tasks right from the interface of Alloy Discovery; Generate reports and charts from your inventory data; Publish interactive drill-down web reports on your Intranet; Export inventory data in XML, HTML, CSV, and Excel formats. WinReporter is an agentless reporting solution that allows you to perform hardware and software inventories, security audits and event log monitoring. WinReporter collects information about hardware, software, events, services, printers, shares, permissions, user accounts, etc. The ready-to-use reports can be customized, printed, exported, or automatically generated and sent to selected recipients at the frequency of your choice. WinReporter also stores all information in a centralized ODBC database which allows you to track evolution and compare your servers and stations.